Title: Prebiotic synthesis of 2-deoxy-D-ribose from interstellar building blocks promoted by amino esters or amino nitriles. How did life begin? How was the first cell born? How did the genetic material develop? Many scientists from different fields are trying to answer this question, but, what is the chemists’ approach? Prebiotic chemistry is chemist’s way to find an explanation! 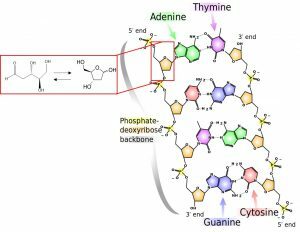 This branch of chemistry explores the formation of amino acids, sugars, and nucleobases -the molecular building blocks of life- from even smaller blocks that existed in the primitive Earth environment. The main idea is that simple atoms and molecules (that were present on Earth) led to the formation of proteins and nucleic acids (e. g. DNA) and eventually to the organization of life in compartments and cells. Prebiotic chemistry probes different pathways that can lead to life as we know it: carbon-based and non-symmetrical (i. e. chiral). An easy example that describes the chirality of bio-molecules are amino acids, building blocks of proteins, that can exist in 2 forms; mirror images of each other (Figure 1). Although they can assume the two forms below, only one of these -with its specific symmetry- can be found in the proteins (left molecule in Figure 1). Why life choose only one direction is still a big mystery. Figure 1: Example of chiarality in the amino acid alanine: This two molecules are the mirror image of each other, but they are not the same molecule (From Jü, Wikimedia Commons). In a similar but more complicated way, the sugar that forms the backbone of DNA exists in four different forms, but only one of these, the 2-deoxy-D-ribose, is present in the biological molecule! The asymmetry of life is a question that is very complicated to answer and the founding of this paper can move us forward on the path to the solution. The authors of this paper synthesized 2-deoxy-D-ribose (Figure 2) starting from materials known to be present on Earth at its early stages: acetaldehyde and D-glyceraldehyde (Figure 3). Figure 2: 2-deoxy-D-ribose in DNA and free (in its chain and ring forms). (Adapted from Madeleine Price Ball, Wikimedia Commons). Figure 3: synthesis of 2-deoxy-D-ribose (3) from acetaldehyde (1) and D-glyceraldehyde (2). They performed the reaction at different pH values and initiated it with different promoters: asymmetric amino esters and amino nitriles (Promoters in Figure 3). In each of these conditions, the reaction always led predominantly to the formation of the desired sugar (3 in Figure 3) with the desired symmetry (3 was always more concentrated than 4) that is the only sugar in DNA. Noticeably the reaction did not proceed without the promoters. Moreover, changing the symmetry of the promoter did not change significantly the ratio between the products; 3 always being produced in higher quantities than 4. This suggests that the asymmetric geometry is retained from D-glyceraldehyde (2). 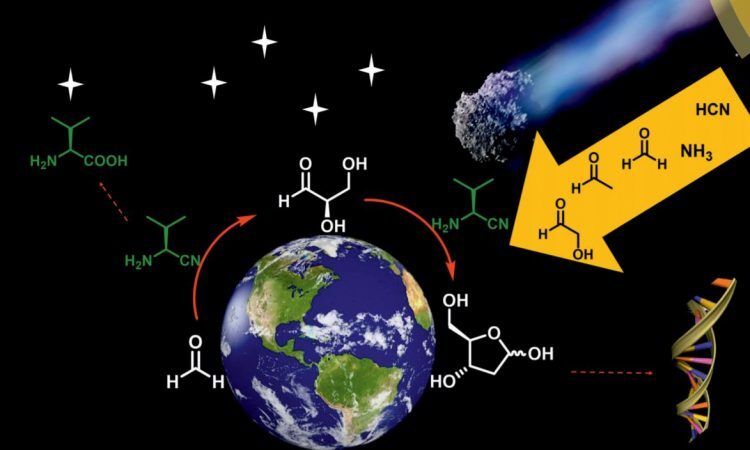 With a different approach, the authors operated a one-pot reaction for the synthesis of 2-deoxy-D-ribose starting from materials that were present in the interstellar space: formaldehyde, glycolaldehyde, and acetaldehyde. This is called the extraterrestrial approach: D-glyceraldehyde is produced from formaldehyde (green in Figure 4) and glycolaldehyde (blue in Figure 4) which then reacts with acetaldehyde (red in Figure 4) to give the final product. Although the reactants were symmetric, the asymmetric initiator and the condition of the reaction led predominantly to D-glyceraldehyde, which then retained the symmetry in the further reaction with acetaldehyde. After 7 days, the reaction produces a mixture of carbohydrates, including 2-deoxy-D-ribose. Noticeably, 2-deoxy-L-ribose was not produced by the reaction. Figure 4: one-pot synthesis of 2-deoxy-D-ribose from interstellar building blocks. The conditions used for the reaction are described. From a small amount of asymmetric promoter, these reactions lead to a selective product -although the reactants are symmetric- and give a first possible explanation of how the 2-deoxy-D-ribose formed from prebiotic materials. With them, we improve our understanding of the asymmetric selectivity of life and make an important step to discover its origins!